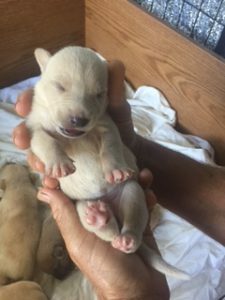 I created this page so that you can see pictures and read updates on the puppies. They were born on Aug. 21st, 2018 so they will be 8 weeks old and ready to go to their new homes on October 16th, 2018. Right now they are so young that there is not a whole lot to say about their personalities, but I’ll try to post new pics and descriptions each week. Pics of the entire litter are under PUPPIES -> LITTER PICS in the menu at the top right. Individual pics and descriptions are on each puppy’s page under the PUPPIES menu. They’ve all been temporarily nicknamed with drink names that match their colors so it’s easier to refer to each one. As a conservation detection dog trainer, I am always on the lookout for adoptable adult dogs that have traits suitable to become one of my working dogs. 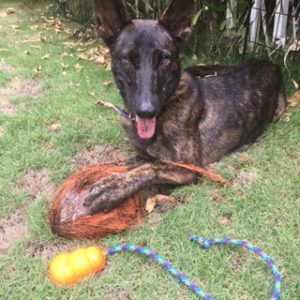 Sometime in June of 2018, I found a Dutch Shepherd on Craigslist that seemed perfect – 3 years old, agile and active, and supposedly from a working line. The dog’s owner had a full-time job and 4 children so didn’t have time to fulfill the dog’s needs. I played phone tag with him for a few weeks without actually meeting the dog. In late July, my husband and I were about to go on a one month trip, so I tried contacting the Dutchie’s owner one last time. He responded and agreed to meet with me so I could assess his dog, named Koko at the time. Koko seemed great – good with people and kids, good with other dogs, healthy, active and full of drive. I knew that if I waited until I returned from my trip, Koko would be adopted by someone else. So I tentatively adopted her and had her examined by a veterinarian. Everything checked out, so I decided I would continue assessing her after my trip, and if all went well, I’d officially adopt her and get her spayed (I had confirmed with the previous dog owner that her next heat was not due until sometime in the fall). I boarded her at Bow Wow Bungalows boarding kennel and then left for my sailing trip. I had a good feeling that I’d end up keeping this dog, so I renamed her to Lea, thinking that Koko sounded too similar to Solo, my other dog. A couple of weeks into my trip, I emailed Claudia and Jay Marr of Bow Wow Bungalows and asked how Lea was doing. They said she was doing well, and that she was a great dog. I was happy to hear that. A few weeks later, my trip was coming to an end, so I decided to check in with the Marrs one more time to arrange a pick up date. Claudia emailed me back to say that Lea was doing fine, but that we “needed to talk.” I thought to myself, Oh no what is going on, did she turn into Cujo and start killing other animals?!? I called Claudia immediately to see what was going on. She asked me if I was sitting down, and then she told me that Lea is pregnant and her puppies will be born any day now. WTH~~!!! I did the math and figured out that Lea was already pregnant when I got her from the previous owner – either he didn’t know or didn’t tell me, arghhh! Lea did not show any physical signs of being pregnant back in late July, and the veterinarian couldn’t tell either. Claudia said that a couple of weeks into Lea’s stay, they started noticing her acting differently around the other dogs – a bit more guarded and snippy, whereas she got along just fine with them earlier in her stay. She also started eating like crazy. But they didn’t put two and two together until they noticed her belly getting big. By the time I got back to Hawaii her belly resembled a rhinoceros belly, although that didn’t deter her from chasing balls (an indication that she might make a good working dog). I was hoping she would have only 5-6 puppies so that it wouldn’t be a huge task finding homes for them all. Jay Marr guessed 8, I think. A few days later Lea gave birth to not six, not seven, not eight…but eleven puppies!!! Claudia stayed up almost all night helping mama dog with the whelping (thank you Claudia!). Unfortunately one of the puppies died a few days later, but the other 10 are healthy and growing. As of this writing (9/11/2018) they are exactly 3 weeks old. They’ve opened their eyes and have started walking around, or should I say stumbling around? 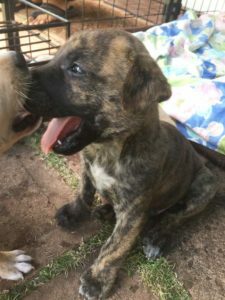 We know that mama dog is a Dutch Shepherd, but we don’t know what papa dog was. It’s most likely a large breed poi dog or maybe even multiple dogs (! ), judging from the pups’ size and the variety of colors. Mama dog Lea (seen in photo below) has been a great dog so far. She is full of energy and drive, but can also settle when nothing is going on. Even though she is a shepherd she is not territorial when guests come to the house; she is great around kids; and she doesn’t mind at all when strangers visit her puppies. I think the puppies will take on many of her traits, and most likely will become 50-60 lbs in size. The puppies are cute as hell, come in various colors, and will be socialized to the best of my ability in the coming weeks so they grow up to be confident in new environments and around strangers and other dogs. 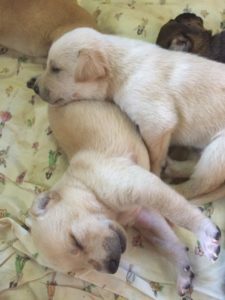 If you’re interested in meeting the pups or adopting one, please call, text or email me, Kyoko at 808-728-8415 or kyoko@countrycaninehawaii.com. I will only ask for a small adoption fee to help cover the cost of their first set of vaccinations and vet visit. The Dutch Shepherd was discovered as a naturally occurring shepherd’s dog type living in the rural areas of the larger region that today includes the Netherlands. When the first breed standard was written in 1898, the coat could be any colour. But, in 1914, it was decided to allow only brindle to distinguish the breed from the then similar German Shepherd and Belgian Shepherd. The breeds eventually diverged into the three distinct breeds as known today. At the farm, they kept the hens away from the kitchen garden, they herded the cows together for milking and pulled the milk carts. They also alerted the farmers when strangers entered the farmyard. Around 1900, sheep flocks had for the greater part disappeared in the Netherlands. The versatile skills of the Dutch Shepherd made him suitable for dog training, which was then starting to become popular. They were then trained and used as police dogs, as search and tracking dogs, and as guide dogs for the blind. They are, however, still capable of herding sheep.